A beautifully made 18 kt white gold band with 90 round brilliant cut black diamonds, est. 0.52ct (Opaque clarity: Black colour), 45 diamonds per edge. 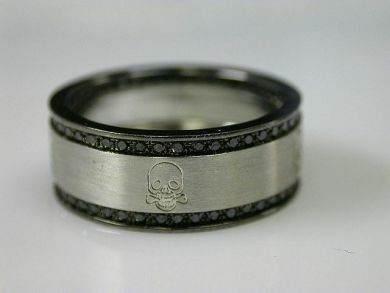 The ring is laser engraved with evenly spaced depictions of ‘skull and bones.’ It is size 7.5.